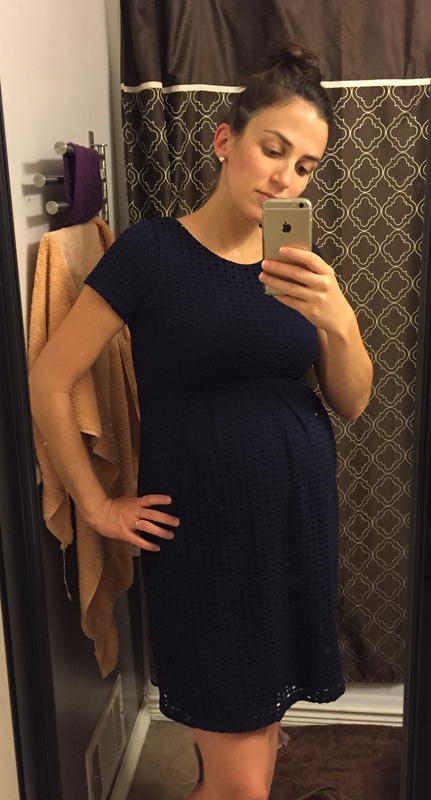 My first Maternity Stitch Fix! I updated my style profile to let the folks at Stitch Fix know I’m expecting in November, and asked for a few pieces I could wear on the regular, either to work in my casual office or out running errands. I’m pretty lucky in that my sister gave me a ton of great stuff (thanks Kim!) from her maternity days, but her style and work environment differ a bit from mine. So aside from a few of her tops and jeans, I’ve been relying pretty heavily on the two pairs of shorts I bought, along with a handful of Old Navy tank tops that are nearing their limits. Sorry, tank tops. I’m gonna wear you til you wear out or you’re no longer long enough to cover the belly, whichever comes first. OK. Back to the box. My Stitch Fix arrived yesterday and when I first opened it, I was pretty excited. There were some awesome colors and the fabrics felt nice, always a good start to a fix. Per the husband’s request, I started my fashion show with the dresses. Up first: Abilene Printed Maternity Dress by Leota Maternity. This dress is cute, light and comfortable. It also gets bonus points because (I think) you could potentially continue wearing it post-partum, as the wrap-style collar gives you a bit of leeway for nursing. That being said, though, it’s a bit expensive when I think about what I’d actually need it for. I don’t HAVE to wear dresses to work, though I can, so I filed this one away into the if-I-keep-the-whole-box, box. Spoiler alert: I don’t keep the whole box. Cost: $98. Verdict: Sent back. 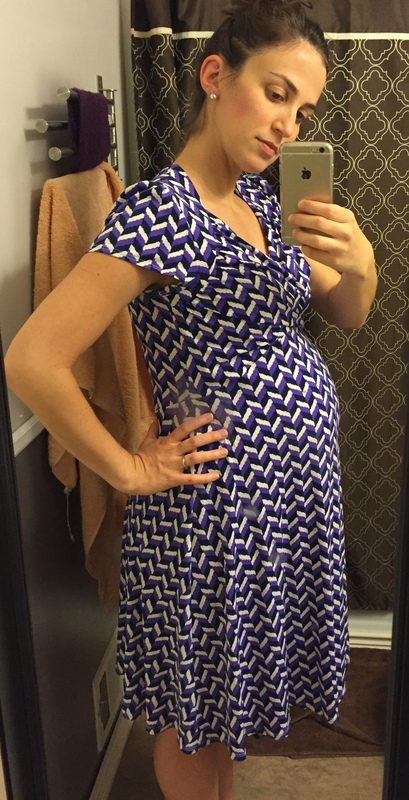 Next up, the Gabre Maternity Dress by Eight Sixty Maternity. Alright, I have to admit, I really love this dress. You can’t tell from the picture (because I’m a terrible selfie-taker and am way too lazy to make someone else do it), but it’s a very pretty navy blue dress with a cut-out overlay. The back dips down a bit (not too much), there are pleats over the bump and overall, it has some really cute details and it’s even comfortable, like a big T-shirt. But again – when am I going to wear this? For the price, I couldn’t justify it on it’s own, and again, it fell into the maybe, if I keep everything, category. It also doesn’t help that my sister gave me a maternity dress (in gray) with a very similar style/cut, so if I were going to wear a dress like this, I’d probably stick with the one I already have. Bummer. Sorry, adorable dress. You deserve someone who wants you as much as you want to be wanted. Cost: $94. Verdict: Sent back. Maternity shopping is so weird. Clothes are expensive, but you’re only going to wear them a few times before you’re back in regular clothes. I think had this been a non-maternity purchase, I would have shelled out the cash. But seeing as how I won’t be this size and shape forever, it doesn’t make much financial sense. Le sigh. Alright, next up, the laughable Azalea Cold Shoulder Maternity Knit Top by Loveappella Maternity. My face in this picture pretty much sums up my feelings on it. Why. WHY would you make this shirt for maternity? Pair those unattractive shoulder slits with a tight (why?) but loose (what?) knit fabric that highlights the fact that my belly button is flattening and widening, and you have this perfectly hateable shirt. Cost: $48. Verdict: Sent back. Now this one. This one, I’m bummed about. 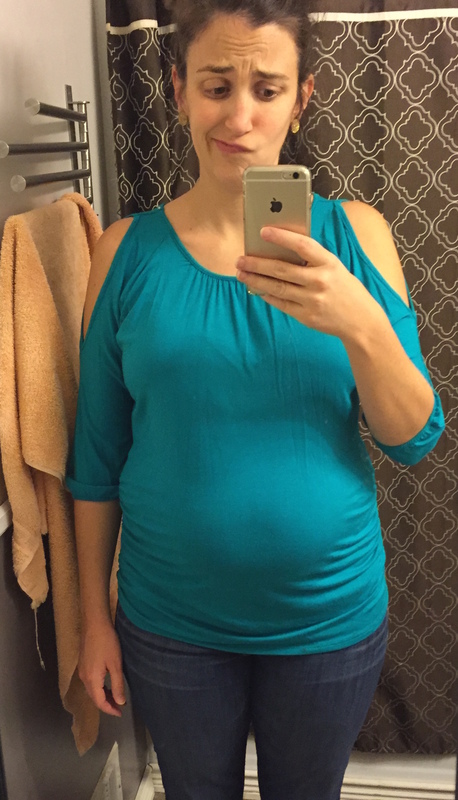 The Anaheim Roll Sleeve Maternity Top by Loveappella seemed at first to be awesome. I mean hey, I’m even smiling in the picture! It fits my basic style (half-sleeved tees, ftw), is a good length and simple enough to go with any number of pants/shorts/leggings to get good use out of it. And then, it started. The itching. Dear lord, the fabric on this thing itches! Now that I’m writing this, I realize it’s those guys at Loveappella again. If I’m going to drop money on a comfortable T-shirt, it needs to be that: comfortable. I couldn’t get this thing off fast enough. Cost: $58. Verdict: Sent back. 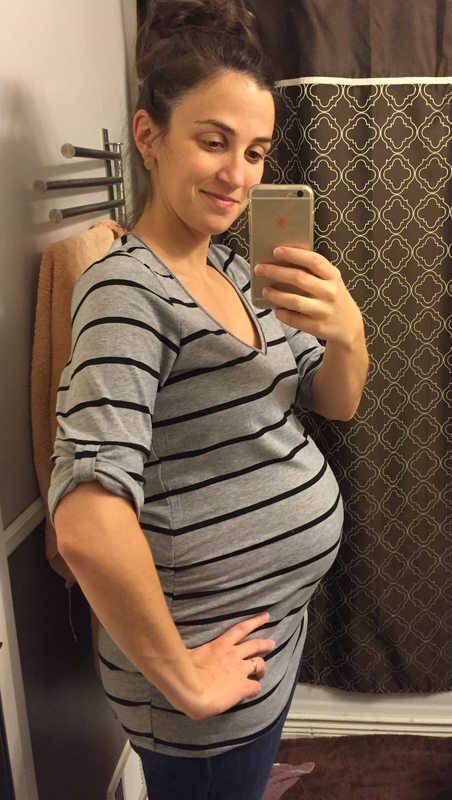 Alright, before you think I’m just a big, pregnant hater, not everything went back. The lone survivor from my first maternity fix was this pair of Kiley Maternity Ankle Zip Leggings, by Rune. Oh hey there, fancy zipper. Again, it may be hard to tell in the picture, but they’re a deep navy (almost purple?) and the zipper detail is in gold. Seeing as how we’re coming up on fall – hooray! – and the supportive maternity waist on these means I’ll probably actually wear them post-partum to hold in all the jigglies, they seemed like a legit purchase. Plus, since this box was free via a referral, the final cost was totally reasonable. And they’re super stretchy, thick and comfortable. Win, win, win. Cost: $58 ($33 after $25 credit). Verdict: Kept! Ultimately, this fix was a total mixed bag. Two things went back gladly, two more I’m a bit reluctant to put into the mailing envelope. But I just can’t justify the expense on something I know I won’t get much use out of, and unfortunately, I just don’t wear dresses all that often. I was really hoping to see more inexpensive basics, considering the short lifespan of maternity clothing. I should probably update my style profile to reflect that. My bad, Stitch fix; my bad. I don’t know why I’m just now seeing this!! You are crazy!! But you’re my kind of crazy and I love you! !